I haven't spent too much time on the topic of hedging in this forum because I wanted to focus on leasing deals and initial results as our understanding of the Haynesville Shale was growing. Now that we are leaving the leasing phase and moving into the drilling phase, it is wise to shift some of the discussion to production issues. One of the biggest and often confusing of these is commodity price hedging. Chesapeake Energy made news last summer when gas prices soared but the company showed a huge accounting loss. While head scratching at first glance, this was the result of the accounting rule that requires companies to book any unrecognized gains or losses on financial instruments like hedges (called "mark to market" accounting, a concept that got financial institutions in a wee bit of trouble this past year). Chesapeake did a great job of locking in prices for future gas sales as prices rose through the first half of 2008. Unfortunately, at least from an accounting perspective, as gas prices continued to spike it made the hedges look "underwater" and the company had to show big losses. When prices sank in the fourth quarter, the company was able to show a fairly sizable paper profit, but since the world was going to hell at that time it didn't seem to matter. EnCana released news on Monday that it had hedged 35% of its 2010 production at an average price of $6.21/Mcf (US dollars, even though EnCana is Canadian). Given the fact that spot prices are hovering around $3.50, that sounds pretty good. 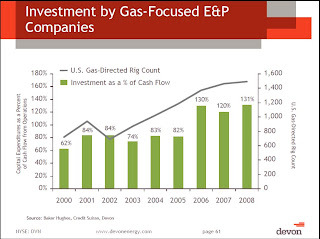 Hedging has greatly benefited EnCana in 2009. 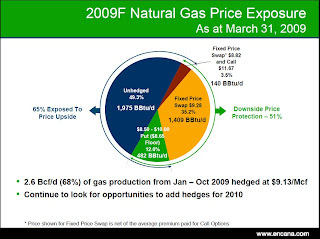 The company has hedged 2.6 Bcf/day of gas through October 2009 at an average price of $9.13/Mcf. Through the first five months of 2009, this hedging program has yielded $2 billion in incremental cash flow over spot prices. This has enabled the company to "double down" on its Haynesville drilling program while others are forced to cut back. Below is a summary of EnCana's 2009 hedging program. Hedging is important for many reasons. Natural gas can be very volatile in price, subject to supply and demand issues, the weather and the strategies of commodities traders. Hedging is an essential tool for producers to have some certainty about future profitability and most importantly cash flow. Cash is king for producers - it allows them to fund capital investment, which drives future production. If you are entirely dependent on the capital markets to raise funds, you are S.O.L. when another 2008 financial calamity occurs. Now that producers have found so many new sources of gas, they are out-spending their self-generated cash flow (see chart below) and are being forced to borrow or sell equity. Every penny of cash they can squeeze out of operations is vital to their growth and viability.